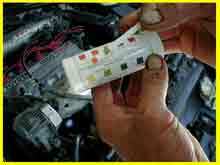 An explanation of the importance of correct radiator coolant for 4 stroke combustion engines. Coolant prior to the 1970 was almost a non event. 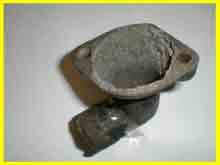 The cooling system requirements for almost all vehicles was satisfied by the addition of a cup full of soluble oil. As long as the water pump had a little lubrication the requirements were satisfied. Times have changed and the modern engine require a sophisticated coolant formula to satisfy current engines needs. The complexity of the problems the modern radiator coolant has to cope with has led to the birth of a new industry. Many companies are jockeying for a position in the market that modern engine design have created. Much research has taken place to determine what cocktail of chemicals best controls the problems of corrosion, hot spot boiling and stray current erosion. A little soluble oil does not fill the requirements of modern motor vehicles. The inhibitor industry is continually doing research to formulate products that offer maximum protection. CORROSION (chemical): The change in engine design and the move to lighter alloys as the main metal used in cylinder head castings has made it necessary to ensure that the coolant does not corrode the components. Modern motor vehicles are built in a very competitive market . 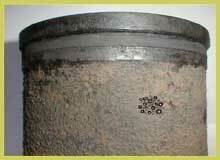 Some manufacturers have used different quality alloy castings, some of which tend to corrode more than others. What is corrosion and how does it occur in relation to alloy heads, blocks, water-pumps and housings? The scientific explanation of metal corrosion is the "chemical change in which metal changes from the elementary state to a combined state." In the case of engines this change normally involves expense and damage. Aluminum and zinc oxides are soluble in alkali solutions. This indicates the importance of the pH. level of the coolant. The pH (measurement of Positively charged Hydrogen atoms) of liquid uses distilled water @ 22 degrees Celsius as the standard. The pH of the distilled water is 7. The pH scale runs from 1 to 14 so if we let the coolant’s pH drop below neutral (acidic) or above neutral (alkaline) we must expect increased corrosion activity of metals. HOT SPOT BOILING (erosion): Until recently this problem was not recognised as the major cause of erosion in modern alloy heads and blocks. This type of erosion is very recognisable as concentrated isolated areas of severe erosion of water ways commonly down the exhaust side of the head. Diesel engines can suffer a similar form of erosion on wet liners. These liners are cast iron. 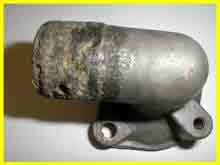 This condition is again caused by the implosion of small oxygen bubbles on the cylinder walls. The difference in diesels is that the bubbles are formed by the violent action of diesel combustion. ( similar to the bubbles that form in a drum of water if you were to bang on the side of the drum with a hammer.) This diesel liner erosion has the appearance of a multitude of small holes in a concentrated area. STRAY CURRENTS: This again is a problem that has only recently become commonly recognisable as a fact in the auto industry. This problem has been addressed in the marine industry for many years. The addition of salt water to the environment has set certain standard in place to slow down or prevent corrosion damage in the marine industry. Motor vehicles can suffer similar problems but not to the extent boats do. 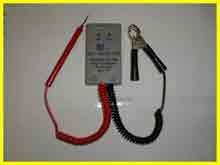 In boats every component involved is separately wired back to the negative terminal of the battery. Stray currents exist in the cooling system of an engine when some of the supply power uses the coolant as a path or partial path back to the negative or earth battery terminal. The best prevention against stray current corrosion is to ensure all earth contact points are paint and dirt free. Tight, clean earth positions have to be maintained . 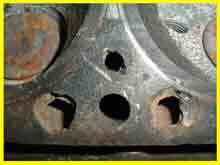 Additional earth straps are sometimes helpful on affected components such as alloy cylinder heads. Stray currents can be measured and the allowable limit is .05 of a volt. These potential serious stray currents can be kept to a harmless level where no noticeable damage is evident. (1) Never mix coolants as some combinations can cause problems. 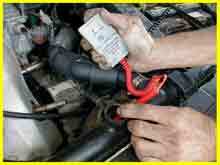 (2) When replacing the coolant, always remove all coolant by flushing with the heater in the "on" position. (3) Always use de- mineralised water to mix coolant. 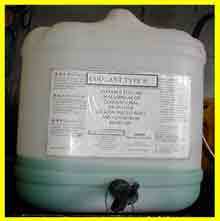 (5) Use a coolant that is glycol based. (6) Check glycol % level. (7) Check for stray currents. 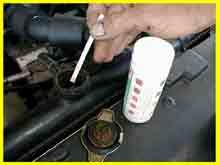 (8) Change coolant at recommended periods. (9) Dispose of coolant responsibly. Check with your local and state authorities. 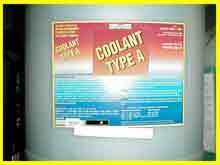 Never dispose of coolant to storm water or sewerage systems. (10) Always pressure test cooling system after service. Caution should be shown when working on hot cooling systems to prevent burns. Don’t remove pressure caps on hot systems. 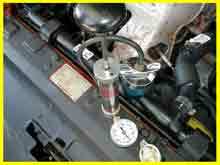 Always reduce pressure before removing radiator or header tank cap. If in doubt have a competent auto mechanic check your system. 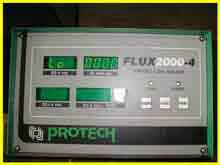 These services are best left to an auto shop as specialised equipment and disposal facilities are required.